Test parameters are the analytes used in tests, the items that are actually measured and for which results are posted. There are nearly 1300 parameters already defined in the HealthCloud Physician Office LIS by default as delivered. However, many of them are not used normally in a POL and so are not Active. The main Test Parameter Management list screen filter defaults to show the first 1000 records, whether active or not. It’s important that you check during Implementation Test Setup that the parameters you need exist and are active. In some cases there are duplicate parameters. The Best Practice of inactivating all versions but one helps ensure correct setup – especially if instruments are to be interfaced at any time (see Mapping Parameters between HealthCloudPOL and the Instrument). There is very little information associated with a parameter by default. Any ranges/limits or specifications are set when they are set up in a Test. They exist initially as basically the names of things which can be measured for a given test. To look at a parameter’s details, navigate to the Test Parameter Management menu item and filter for the parameter you seek, then click on its Parameter Name. If Published and Active, the parameter’s name, the Published checkbox and Delete button are grayed out so that they cannot be edited and the parameter may not be deleted. A parameter, once published, cannot be edited or deleted. It can, however, be made “Inactive” by un-checking the Active checkbox, whereupon it will be unavailable for use in a test. A parameter can be copied or new ones made. To copy an existing one, in its detail screen simply click the Copy button and give it a new name (be very careful not have more than one parameter with exactly the same name). 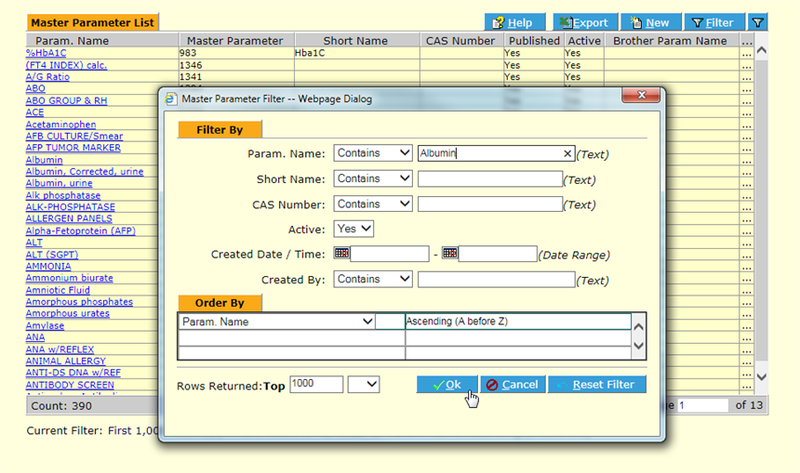 To make a new one, in either the Master Parameter List screen or the Master Parameter Detail screen use the New button.